YOGYAKARTA, Indonesia -- The quiet city of Yogyakarta on Java, Indonesia, is flanked on both sides by two ancient temples paying homage to two different faiths. To the west is Borobudur Temple, a massive stone structure that soars up into the sky surrounded on all sides by lush jungle greenery. Built in the ninth century, Borodubur is the largest Buddhist temple in the world -- but it was a well-kept secret after being mysteriously abandoned. It lay quietly preserved by a tomb of volcanic ash until it was discovered in the early 19th century by British Lt. Gov. of Java Thomas Stamford Raffles. The discovery was a sensation: an ancient 10-story temple constructed with 2 million stones and housing over 500 stone Buddhas. With buses and taxis readily available to drop visitors off in front of the entrance to the temple, it is a surprisingly easy walk up to the uppermost levels. Borobudur‘s 10 levels are designed to correspond with the path to enlightenment. The base is stacked with five concentric square terraces connected by staircases in each direction, which are then topped by three circular terraces and ultimately by a monumental stupa. From a bird’s-eye view, the temple forms a lotus flower. The temple is designed so that visitors can walk clockwise down the open-air paths along the terraces as they move upward while meditating upon the path to enlightenment. The walls lining the five square terraces are etched with nearly 3,000 bas reliefs depicting the life and teachings of the Buddha. As the temple itself was thought to have taken about a hundred years to build, it is interesting to see that the techniques used to carve the reliefs evolved over time. Details in the scenery and faces become more pronounced in certain reliefs than in others. Although some of the reliefs have become faded or worn by the elements, a water irrigation system put in place when the temple was restored with the help of UNESCO helps to preserve the original artwork. On the circular terraces sit 72 cross-work stupas, each with a Buddha sitting inside visible through the woven walls. The temple has become a major tourist attraction in the area, and is crowded through most of the afternoon. For early-risers, the temple offers admission from 6 a.m., but even at that time it is difficult to catch sunrise from the top of the temple. Although the temple itself is a beautiful sight, it is worthwhile to glimpse out as one walks up the terraces at the jungle surrounding the temple, observing how the timberline slowly meets the sky. 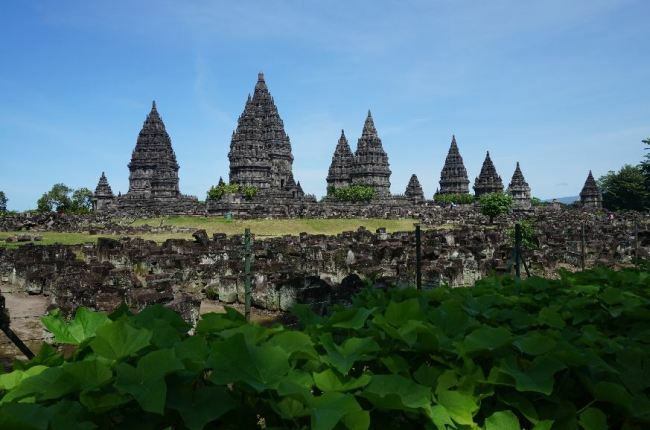 On the other side of Yogyakarta sits an equally magnificent Hindu masterpiece, Prambanan Temple. Unlike Borobudur, which is one giant complex, Prambanan is made up of several stone shrines clustered together in the heart of a wide, green park. Built about a half century after Borobudur, Prambanan was also in ruins for many years. Reconstruction is still ongoing, and the main temples are surrounded by piles of rocks that represent what is left of the 224 minor temples of the outer compound. The main reconstructed temples are also dotted with new rocks particularly near the foundations, which were used to restore the temples. It is best to begin a tour of Prambanan at the three major temples dedicated to the main gods of the Hindu faith: Shiva, Vishnu and Brahma. The first shrine to visit is the Shiva Mahadeva Temple, which contains five chambers connected by narrow staircases. The main chamber contains a statue of a four-armed Shiva, while the other chambers contain figures of Ganesha, Shiva‘s son, and Durga, Shiva’s wife. The statues are out in the open in each of the chambers, and visitors are free to walk around the statues and touch them. In the case of Durga, her nose has been worn down by countless women putting faith in the myth that touching Durga‘s nose will imbue them with youth and beauty. Each of the three main temples are accompanied by a smaller temple for the corresponding animal of each god. Nandi temple contains a statue of a bull belonging to Shiva, Hamsa temple for a swan belonging to Brahma and Garuda temple for Indonesia’s iconic bird, belonging to Vishnu. Garuda is also the namesake of the country‘s flag carrier Garuda Indonesia. The gardens and grounds surrounding Prambanan are excellent for a stroll after touring the temples themselves. Walking around the temples gives one a feeling similar to that of walking around old palaces in Korea, which also have wide open grounds between the various buildings. 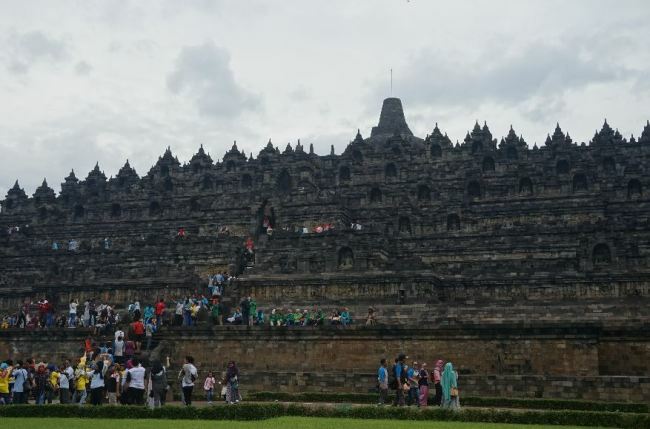 Although there are various tour packages that offer tours of Borobudur Temple and Prambanan Temple in a single day, it is recommended to visit each on a different day in order to fully appreciate their respective beauties. 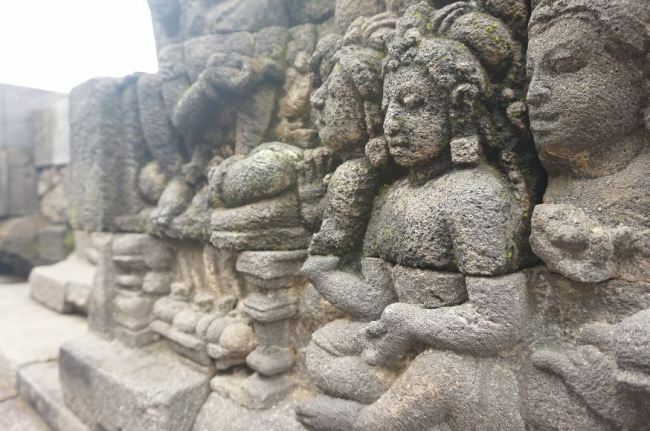 Borobudur Temple is most striking in the early morning -- and most peaceful -- while Prambanan Temple can be enjoyed in the late afternoon and followed by a visit to the nearby Ramayana Ballet in the evening.